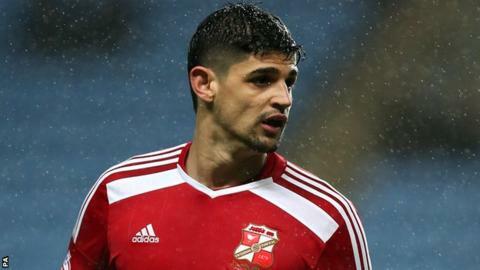 Swindon moved back into League One's top two with victory over Barnsley. The hosts went ahead in the first half when Chelsea loanee John Swift whipped the ball in from the left and defender Raphael Rossi Branco lashed home. The former league leaders should have made it 2-0 but Andy Williams saw his penalty saved by Ross Turnbull, after Swift was felled by Paul Digby. But Turnbull gifted Swindon their second after the break, failing to smother Ben Gladwin's shot. Mark Cooper's side went back up into second after MK Dons and Bristol City played out a 0-0 draw, while Barnsley fell to 15th after their sixth consecutive away defeat in the league. Swindon dominated the first half and midfielder Swift's weaving move into the box was converted well by Branco for their opener. Swift then earned his side a spot-kick, when he went down under Digby's challenge, but goalkeeper Turnbull went the right way to stop Williams' weak attempt. Barnsley boss Danny Wilson kept top scorer Conor Hourihane on the bench until the second half and his introduction boosted the Tykes. Swindon's flailing defence had to scramble to stop Hourihane's side-footed shot, with Branco making a last-ditch block, and Foderingham saved well from Peter Ramage. But Gladwin put the result beyond doubt when he struck from the edge of the area and the ball squirmed underneath Turnbull. "I thought we were very good. I thought we totally dominated the football. "The game should have been over a lot sooner than it was but we understand you can miss chances, you can miss penalties. "All in all I thought it was a really good performance." "If you give a goal away as we did in the first instance you're going to have your backs against the wall. "It was a very sloppy goal, we just fell asleep. We didn't pick the man that went out for the short corner. "We've made a couple of mistakes and they've scored. But as the game went along we started to make it difficult for them." Match ends, Swindon Town 2, Barnsley 0. Second Half ends, Swindon Town 2, Barnsley 0. Attempt missed. Dale Jennings (Barnsley) right footed shot from outside the box misses to the right. Yaser Kasim (Swindon Town) is shown the yellow card. Attempt missed. Josh Scowen (Barnsley) right footed shot from outside the box misses to the left. Attempt blocked. Conor Hourihane (Barnsley) right footed shot from outside the box is blocked. Corner, Barnsley. Conceded by Jack Stephens. Attempt missed. Massimo Luongo (Swindon Town) right footed shot from outside the box is close, but misses to the left. Goal! Swindon Town 2, Barnsley 0. Ben Gladwin (Swindon Town) right footed shot from outside the box to the high centre of the goal. Corner, Swindon Town. Conceded by Conor Hourihane. Corner, Swindon Town. Conceded by Peter Ramage. Corner, Barnsley. Conceded by Raphael Rossi Branco. Attempt saved. Massimo Luongo (Swindon Town) left footed shot from the left side of the box is saved in the bottom right corner. Attempt missed. Jean-Yves Mvoto (Barnsley) header from the centre of the box is too high. Attempt saved. Peter Ramage (Barnsley) header from the centre of the box is saved in the centre of the goal. Attempt blocked. Conor Hourihane (Barnsley) right footed shot from the centre of the box is blocked. Substitution, Swindon Town. Ben Gladwin replaces John Swift. Attempt missed. Michael Smith (Swindon Town) header from the centre of the box is just a bit too high. Attempt missed. Michael Smith (Swindon Town) right footed shot from the right side of the box is too high. Corner, Swindon Town. Conceded by George Smith. Substitution, Swindon Town. Michael Smith replaces Andy Williams. Substitution, Barnsley. Alex Kiwomya replaces Milan Lalkovic. Corner, Swindon Town. Conceded by Ben Pearson. Dale Jennings (Barnsley) wins a free kick in the attacking half. Corner, Swindon Town. Conceded by Ross Turnbull. Attempt saved. Andy Williams (Swindon Town) right footed shot from outside the box is saved in the top left corner. Attempt saved. Andy Williams (Swindon Town) left footed shot from the centre of the box is saved in the centre of the goal. Nathan Byrne (Swindon Town) wins a free kick on the left wing. Foul by Dale Jennings (Barnsley). Corner, Swindon Town. Conceded by Josh Scowen.